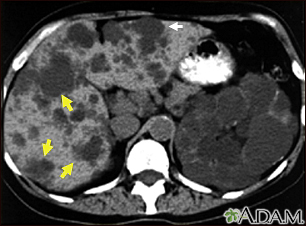 This abdominal CT scan shows cysts in the liver and kidneys (polycystic disease). The liver is the large organ on the left side of the screen. The dark spots in the liver are cysts. 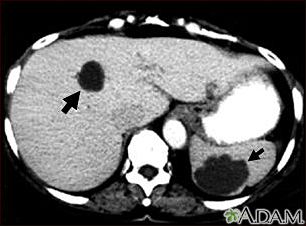 This abdominal CT scan shows multiple cysts in the liver and spleen. Note the dark circular cyst in the liver (left side of screen) and the large, irregular, circular cyst in the spleen (bottom, right side of screen).